During the 16th century the Peacock family of Redbourn in Hertfordshire acquired land here as part of an extensive estate. The family’s descendants sold the land to Sir John Lade, whose son and namesake built Frith manor house in 1790 but had to sell off a neigh­bouring farm to pay gambling debts. Woodside was sparsely populated at this time owing to its remoteness and to the poor quality of the soil, which was mainly used for haymaking. Around 1840 Joseph Baxendale built Woodside House in Whetstone, with grounds that extended well to the south-west. Woodside Park station opened in 1872, originally as Torrington Park, and Joseph Baxendale died in the same year, bequeathing Woodside House as a ladies’ retirement home. The charity that was entrusted to run the home sold off much of its grounds to developers, the most signi­ficant of whom was Henry Holden, who began to lay out new roads near the railway line on what he called the Woodside Park estate. Holden built Woodside Hall as a community asset in 1885 but progress was limited – on Holden’s estate and elsewhere – and by the end of the century only dairy cattle populated the 200 acres of Frith Manor Farm. St Barnabas church was built on Holden Road in 1912–14. ‘St Bs’ is nowadays an ‘evangelical charis­matic church’ within the Diocese of London – and it draws its large congreg­ation from across Finchley and beyond. If suffi­cient funds can be raised, there are plans to move to larger premises in North Finchley. 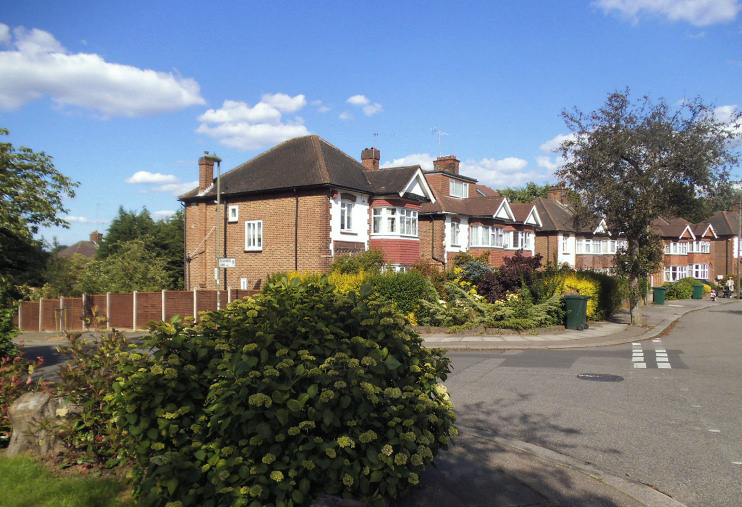 In the late 1920s a new developer began buying up land on the western side of Dollis Brook. Fred Ingram set about creating a 100-acre garden suburb with three-bedroom semi-detached houses in a variety of comple­mentary styles. He named the new roads after the haunts of his Sussex boyhood, such as Cissbury Ring, which is shown in the photo above (in its Woodside Park version). The project was a success and Ingram slowly expanded the suburb until war inter­vened. Post-war expansion was limited by green-belt restric­tions and new building was mainly confined to the Southover area. In recent decades some of the larger old houses have (almost inevitably) been replaced by compact, privately built blocks of flats. Like much of Finchley, Woodside Park has long attracted Jewish residents and Woodside Hall became a synagogue in 1950. More recently (and again like much of Finchley) the suburb has also become popular with Japanese families. Other ethnic groups include those of Italian, Greek, African, Indian and Chinese heritage. 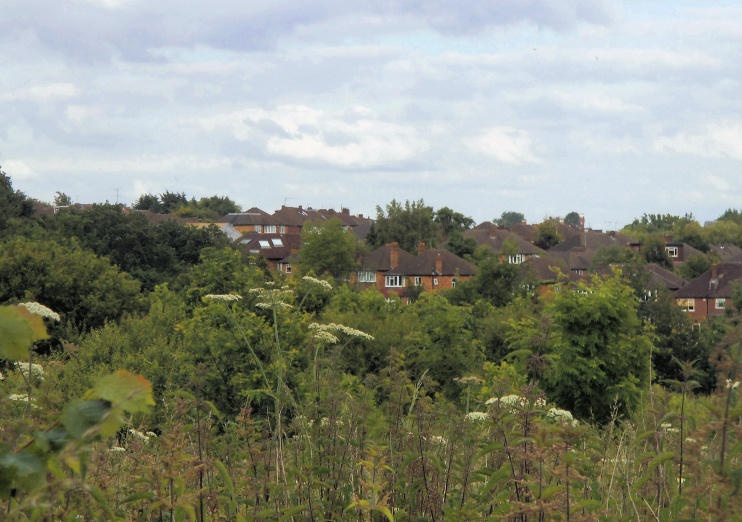 * The view across Woodside Park from the fields and the picture of Cissbury Ring North at the junction of Scaynes Link on this page are both adapted from original photographs, copyright David Howard, at Geograph Britain and Ireland, made available under the Attribution-ShareAlike 2.0 Generic Licence. Any subsequent reuse is freely permitted under the terms of that licence.